Goo morning! There's some quite good stuff today, including a collection of dark fantasy stories by Algernon Blackwood that ere praised by H. P. Lovecraft, a continuing serial, audio horror at Pseudopod ( a trio of flash horrors), a collection of audio horror stories at LibriVox (including Poe, Lovecraft, Blackwood, Clark Ashton Smith, Hawthorne, and more), flash fiction, comic books, and more. 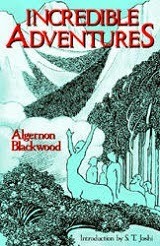 • At Project Gutenberg: Incredible Adventures by Algernon Blackwood. Weird. Dark Fantasy. 1914. "In the volume titled Incredible Adventures occur some of the finest tales which the author has yet produced, leading the fancy to wild rites on nocturnal hills, to secret and terrible aspects lurking behind stolid scenes, and to unimaginable vaults of mystery below the sands and pyramids of Egypt; all with a serious finesse and delicacy that convince where a cruder or lighter treatment would merely amuse. Some of these accounts are hardly stories at all, but rather studies in elusive impressions and half-remembered snatches of dream. Plot is everywhere negligible, and atmosphere reigns untrammelled:" H. P. Lovecraft quoted at Wikipedia. • At Silver Blade: "The Greatest Shade – Part 4" by Bryan Wein. Fantasy. At Every Day Fiction: "The Ghosts of Becca Wolf" by Richard M. O’Donnell. Horror. At 365 Tomorrows: "Breaking Barriers" by Aron White. Science Fiction. • At LibrVox: "Short Ghost and Horror Collection 022" Horror. "A collection of twenty stories featuring ghoulies, ghosties, long-leggedy beasties and things that go bump in the night. Expect shivers up your spine, the stench of human flesh, and the occasional touch of wonder. " • At Pseudopod: "Flash on the Borderlands XVII: Keeping Up Appearances" Horror. “Down By The Sea Near The Great Big Rock” by Joe R. Lansdale, “The Demon Fields” by Keith McCleary, and “Pawn” by Jaki Idler. At Atomic Kommie Comics: Lars of Mars "Villain or Hero?" Sci-fi. 1951. At Atomic Kommie Comics "Invincible Eranus" Sci-fi. 195x. At Atomic Kommie Comics: "How the 3 Rocketeers Teamed Up!" Sci-fi. 196x. At Four-Color Shadows: "Famous Explorers of Space # 5" Sci-fi. 1954. At Heroines: Agar-Agar "Forest of Life and Death" Sci-fi. 1971. At The Horrors of It All: "Man at the Grave / Fangs of the Vampire" Horror. 1954. At The Horrors of It All: "Mummy's Hand / Curse of Frankenstein" Horror. 196x. Audio at WMG Publishing: "The Ghost of Willow’s Past" by M.L. Buchman. Fiction at WMG Publishing "The Amazing Quizmo" by Kristine Kathryn Rusch. Fiction Online Pulps: "Mementos of Murder" by John L. Benton. 1948, "Green-eyed Vengeance" by Arthur J. Burks 1936, and "Thief in the Cupboard " by Ray Fulbright. 1947. Pulp. Noir.